Air quality is one of the most overlooked parts of home maintenance, which is unfortunate because of how important it is. Poor air quality can lead to health issues and illnesses that can be avoided with a few easy changes. If you’re looking to improve the air quality in your home and you want some professional assistance, call Tippetts Mechanical today. We are Las Vegas’ HVAC gurus. You may think that basic air conditioner and furnace filters are able to remove contaminants and improve air quality, but unfortunately, that is not the case. Basic paper filters are designed to keep dust and debris out of your HVAC system; indoor air quality is not their strong suit. Replace them with HEPA filters, which are actually designed with improving indoor air quality in mind. A HEPA filter is made up of layers upon layers of glass fibers, which are able to more effectively improve air quality than paper. HEPA filters are able to trap more than 99 percent of pollen, dust, and smoke, keeping the air in your home free of contaminants, pathogens, and other harmful microorganisms. To ensure they are able to do their job properly, replace these filters every three months. Your HVAC system is not the only piece of the home that needs quality filters. A dirty or old filter in a vacuum, air purifier, or clothes dryer can all negatively impact the air quality in your house. Ensure these are replaced or cleaned regularly so they are able to work as they’re intended. When you are cooking on the stove, it’s important you always run the exhaust fan with it to ensure harmful particles are sent out of your home properly. Check the screen of the exhaust fan regularly to make sure it is not clogged up with food debris and grease. As for the other vents in your home, make sure they are clear and cleaned on a regular basis. The same goes for any HVAC registers in your home. Before flinging open your windows like Scrooge on Christmas morning, check the air quality in your area through a local news or weather outlet. Letting poor quality air into your home makes it more difficult for filters and vents to do their job properly. If your home has a fireplace, it’s imperative you have your fireplace’s flue inspected. If it is leaky, it can be a source of deadly carbon monoxide. Have a professional inspect it regularly to keep your family safe and breathing easy. If your bathroom doesn’t have air vents and fans, it can seriously negatively impact your home’s air quality. After taking a hot shower, if that air is not properly vented, the moisture will develop into mold over time. Not only is mold harmful to breathe in, it can be an expensive prospect to clear it out depending on how much it has advanced. When it has been a while since an air duct has been cleaned, dust, dirt, and other debris will accumulate and circulate through the air. Not only will cleaning out a clogged up duct improve your home’s air quality, it will also reduce the amount of strain placed on your HVAC system, as it won’t have to work as hard to properly circulate the air through your home. That prevents system breakdowns and reduces the amount of consistent maintenance that will need to be done. Avoiding harsh chemicals is a very easy way to improve air quality. Use more environmentally friendly cleaning products to avoid putting volatile organic compounds (VOCs) in your air supply. Sticking with some hot water and a little bit of dish soap for your cleaning with keep the air clear for you. When you have your HVAC system inspected, repaired, and maintained on a regular basis, you will prevent many of the biggest issues that affect air quality. This maintenance includes adjusting and cleaning fans, checking for any possible leaks of refrigerant, and cleaning of indoor and outdoor coils to ensure they are cleared of any buildup of grim, mineral scales, or other harmful debris. Without this regular maintenance, water leaks can develop which will cause mold to grow, dangerous refrigerant can leak, and your system can be circulating harmful contaminants instead of clean air. 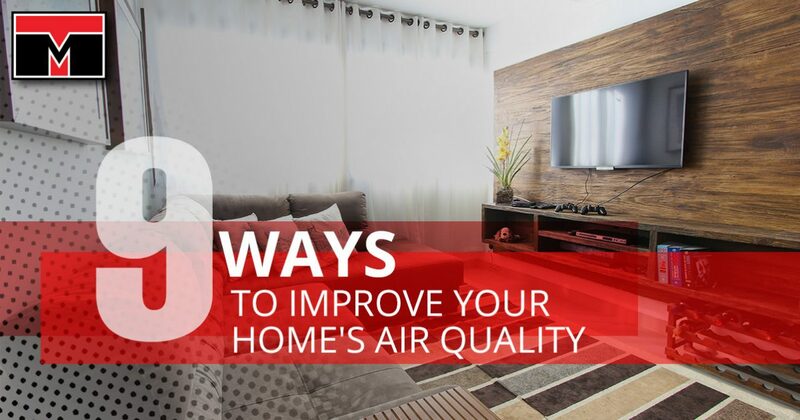 Air quality is something everyone should consider vital to their everyday home life. Not only is it important to your health and safety, it will also save you money to ensure your HVAC system is doing its job properly. When you’re ready to improve your home’s indoor air quality, call Tippetts Mechanical. We have years of experience and want to help make your home life better. With Tippetts Mechanical on the job, you can breathe easy.